Cocktails, wine, beer or juice. All you need is a DRINKET ROSE GOLD TUMBLER. DRINKET ROSE GOLD TUMBLERS are easy to hold and perfect for any drink you can think of! Fill em' to the brim and you've got 5 fluid ounces of desired drink inside. DRINKET ROSE GOLD TUMBLERS are the perfect size for serving a versatile range of drinks at your upscale event including champagne, soda, mixed drinks and top shelf liqueurs served on-the-rocks. These cups are also great as punch cups at your reception drink stations. DRINKET ROSE GOLD TUMBLERS make perfect drinkware outside! Great for patio, poolside, picnic, and other outdoor uses. Place a stack of DRINKET ROSE GOLD TUMBLERS at your self-serve bar or beverage station for guests to help themselves during your reception or stock your reception bar so the bar tender will have plenty of cups for serving drinks throughout the day and evening. The last thing you want, is to run out of cups at your special event!! BEAUTIFULLY ENHANCE YOUR BEVERAGE PRESENTATION - Instantly upgrade the beverage service at any wedding reception, banquet, and other catered event with this beautiful crystal clear tumbler with a decorative rose gold border around the top. EXCEPTIONAL DURABILITY - Made of hard, durable polystyrene, this plastic tumbler gives you superior strength and durability without the hefty cost and risk of breakage that comes with traditional glass beverageware. COST-EFFICIENT - Providing high-quality items for a low, economical price. Instantly upgrade the look and feel of your wedding reception, banquet, and other catered event with this sophisticated tumblers! EFFORTLESS CLEANUP - The disposable design of these tumblers makes cleaning up after an event or busy dinner service a breeze. This cup is the perfect solution for elegant yet convenient dining at any venue! SATISFACTION GUARANTEED - We stand behind of our products 100%. 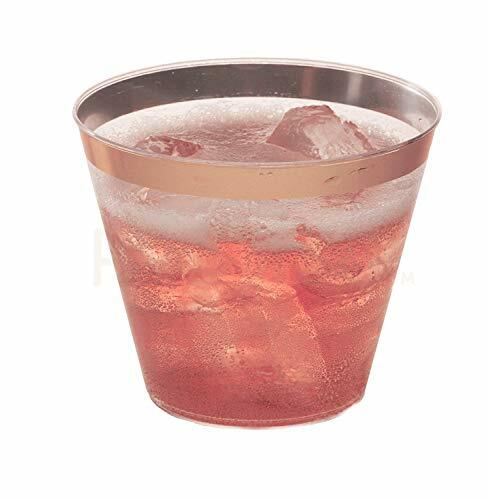 We use strong durable packaging to guarantee that your plastic disposable cups for parties arrive in the best condition possible. If you have any questions about this product by Prestee!, contact us by completing and submitting the form below. If you are looking for a specif part number, please include it with your message.